It's been just a little over a year (since Hurricane Irene), and again the east coast (including New Jersey) was pummeled by a storm -- this time named Hurricane Sandy. Expect delays in the delivery of The Genealogy News and our regular database updates. When I saw a TV commercial for Angie's List the other night, it sounded like a useful service; but I really wasn't expecting to find genealogists reviewed. Well, surprise! There are plenty of them. If you've been considering hiring a professional to assist with your family history research, now there's a web site you can visit first to see if any researchers in your area have been reviewed. There is a slight down-side to Angie's List (well, sort of). Consumers are required to pay a membership fee to join. It's not a lot of money ($26/year), but might pose a barrier for many genealogists (who have a limited budget). According to their web site, "membership fees help ensure reliable data, provide actual staff support and enable publication of [their] award-winning monthly magazine, among other things." They do offer a 110% money-back guarantee, so you can always give it a try and then cancel if you don't find enough value for researchers (and/or other contractors) in your area. While you might not be pleased to see that there is a fee, it hopefully reduces the fake (i.e. posted by company employees posing as consumers) and vulgar posts you often find on free sites that encourage customers to review the services they receive. Plus, Angie's List is not a complaint board, as members are encouraged to review any/all services rendered -- good and bad! I have registered Genealogy Today with Angie's List, and encourage anyone who has subscribed to our database service to post a review. Also, as an added benefit for Angie's List members, I plan to offer a subscription discount (however, this option is not available until Genealogy Today receives some reviews). Was "danger" your ancestor's middle name? There have always been jobs where the employees were prone to having accidents, sometimes fatal ones. And yet, these industries have always had people responsible for monitoring the work conditions and pushing for better safety precautions. Even today, mining remains a very risky career, so its not surprising that many men were injured deep beneath the Earth's surface. 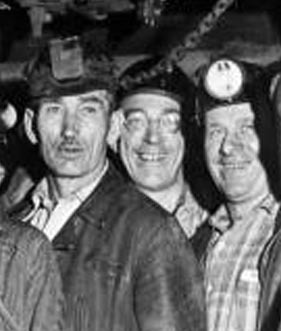 In many states across the country, where mining was a prevalent industry, there were inspectors who produced reports documenting the fatal and non-fatal accidents that occurred during the year. Check out the growing group of these mining reports (and the transcribed accident reports) in the Genealogy Today Subscription Data collection. Not only were railroad employees subject to the occasional accident, but railroad tracks all too often attracted people who ended up in the wrong place, at the wrong time. State Railroad commissioners had the task of recording the accidents that occurred along the lines running through their states. Likewise, many railroad fraternal groups offered insurance-like benefits to their members, and recorded events that sidelined members. Browse through this list of railroad reports and see if any of your ancestors suffered mishaps. When man discovered steam, the world became a warmer place (or at least the workplaces of our ancestors did). But with steam, comes incredible amounts of pressure, which often resulted in extraordinary explosions. When I stumbled upon a copy of The Locomotive, a newsletter published by the Hartford Steam Boiler Inspection and Insurance Company, and saw that each issue contained a short report about recent accidents, it seemed like an excellent (albeit somewhat gruesome) genealogical resource. Check out the insurance records page for a list of issues that have been transcribed. When someone mentions farming accidents, your first thought is probably "man plus tractor equals accident," but the weather, particularly lightning, was more of an ongoing problem. Lightning was a constant threat to some farmers, causing fires as well as killing livestock. Among the insurance records we've transcribed, are many instances of farmers making claims for lost horses, cows and even sheep. With all the trees and buildings, how does a little sheep get struck by lightning? As far back as the 1850's, farmers protected their livelihood by opting for property insurance, and many of the reports issued by insurance companies list the claims they paid during the year. There are plenty of interesting resources that you won't often find in the genealogy section of libraries, but you fill find many of them transcribed at Genealogy Today. Whether its a report documenting factory accidents, or firemen injured in the line of duty, we're always looking for alternative sources of genealogical information. Yesterday, I transcribed an 1822 directory for Washington, D. C., and also posted some of the miscellaneous information it contained. It's been sitting on my desk for the longest time, patiently awaiting it's turn. Like many city directories, reading it takes some effort, and I cannot imagine the work that was involved in putting it together. How did the interview go? Question: "So, where do you live?" Response: "On the south side of G street north between 17th and 18th streets west" Which was then translated into "s side Gn btw 17 and 18w." Here's an amusing one, works at "corner Penn av and 21w" and resides "nearly opposite." Say what? I'm not sure exactly how that would have helped to find the person if you were living in 1822 -- this is what makes genealogy such a fun (and frustrating) hobby. In the back of the directory, there were some job descriptions that I've also posted online, including Inspector of Flour, Chimney Sweeps, and my favorite, Scavengers. 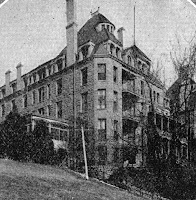 And there were some brief historical details for organizations like the Orphan Asylum (which at the time was only supporting females), the newly established Columbian College, and the Education Society of the District of Columbia (for pious young men). All of the added information is linked at the bottom of the 1822 directory page. This item is part of the Genealogy Today Subscription Data service, and a subscription is required for full access. 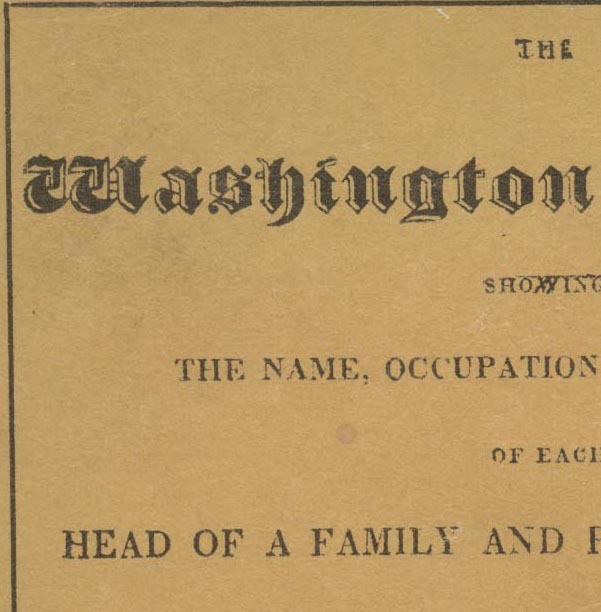 The name index, however, can be searched for free, so check out the Washington Directory of 1822 and see if any of your ancestors were living there and working as a SCAVENGER! Labels: city and county directories, occupations, old terminology, Washington D. C.
Check this out... it's the most interesting and informative article I think that I've ever posted. It comes from an old book about surname origins and meanings by Leopold Wagner entitled "Names: And Their Meaning -- A Book for the Curious." There are so many terms that I've seen in documents, especially occupations listed on old census records, but have never understood. This article explains how they came about, but it also explains many commonplace titles that you may be surprised to learn of their true origins. Words like Teetotaler or Quack and many others! 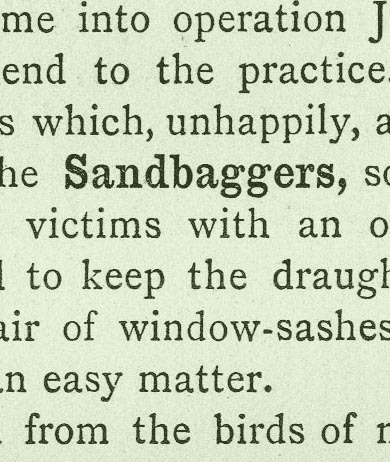 The oddest item in the article... "The latest terror of the streets which, unhappily, abounds in American cities, are the Sandbaggers, so called because they stun their victims with an ordinary sand-bag, such as is used to keep the draught from penetrating between a pair of window-sashes; after which robbery becomes an easy matter." What? Stunning their victims with sand-bags? That's just crazy! It's a rather lengthy article, but it's so interesting it reads quickly. Be sure to visit Class Names and Nicknames (1893) in the Archived Materials section of Genealogy Today. In her new book, "From the Family Kitchen," Gena Philibert-Ortega explores the value of our food heritage and the importance of leaving a legacy for future generations. Among some of the old recipes found in the book is a method for cooking squirrels, although dated 1894 in Los Angeles, this cook's squirrels came from the market. Not so for my ancestors. According to my Uncle Jesse, who spent a great deal of time with his grandparents, Grandpa Durham was a squirrel hunter. I never thought to ask what he did with all those squirrels -- I suppose he could have sold or traded them, but I they probably ate a good few, as well. Grandma and Grandpa Durham migrated from Alabama to Texas soon after they were married in 1872. For many of the pioneers migrating West across America, squirrel was on the menu. Cookbook author Hank Shaw calls squirrels the "chicken of the trees." Squirrel and rabbit, they say, are interchangeable, and apparently so is chicken, according to some of the recipes I came across in my newspaper search. In fact, newspapers are great place to look for old recipes (and social customs of every variety), especially if you have access to a digitized collection that lets you limit your search in multiple ways such the Newspapers & Publications on Ancestry.com. Giving it the old college try, I thought I'd see what kind of squirrel recipes I could find. On the search page for the newspaper collection, I entered only my location of interest "Texas, USA" and two keywords, "recipes, squirrel." Among the many entries was a 1935 recipe from the Port Arthur News, Port Arthur, Texas, for Brunswick Stew (an original squirrel recipe), and a little farther down in the same article a recipe for Squirrel Pie. In searching for recipes, you could also narrow the search by date, or even by ethnicity using the Collection Priority drop-down menu. And true to the addage, "waste not want not," every bit of the squirrel was used. In addition to providing a meal, the skins might have been sold or personally used. Squirrel tail was (and is) used as a lure to catch fish (it was also used in the stew); the skins were used to make make banjo strings; squirrel pelts were used for hats, vests and blankets (and later, even fashionable women's coats); and the hide could also be tanned and made into a soft leather for pouches and other uses. And remember, this is history -- today it may seem almost barbaric, but for our ancestors, in many cases it was survival. In just a few hours, the 1940 U. S. Census will be opened for public use. For genealogists this has been a long time coming, and many are eager to begin the volunteer FamilySearch indexing project. We've compiled the most popular news stories and articles into a special edition of The Genealogy News. This is a free service of Genealogy Today. To read the Special 1940 Census edition, visit the News Center page and click on the link to open the Adobe Acrobat (PDF) formatted file. Included in this edition are links to all of the web sites that will be hosting 1940 Census indexes as they become available. We recently posted a 1926 membership list for the National League of Commission Merchants, along with some background materials on the organization. While the list only identifies the member company owners, it offers some interesting information about their business. 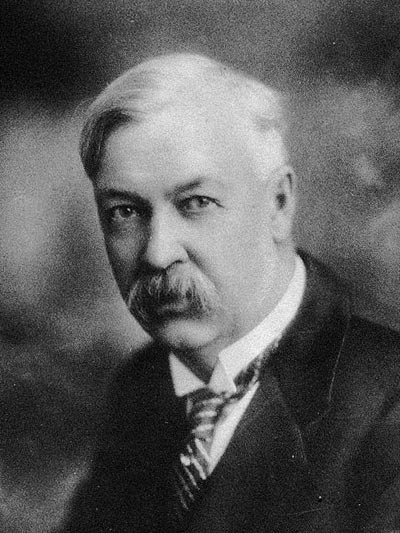 For example, the A. J. Lemkau Co., Inc. in New York City was a produce distributor with a specialty of Celery. All of the sudden, you've got a unique fact that you may not have known before. What I love about these kinds of clues is that they open up new ways to search newspapers of the time. Instead of just focusing on the name, you can search for any mentions of Lemkau and CELERY! 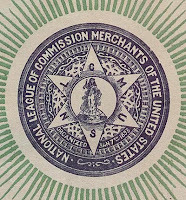 If you'd like to learn more about the National League of Commission Merchants of the United States, I've posted an NLCM Overview and also an NLCM Historical Sketch, both from this original document. Earlier this month, real-time search results from OneGreatFamily.com were added to the improved search engine at Genealogy Today. And today, results from the historical newspaper collection at GenealogyBank.com were integrated. These add-on searches work in parallel to whatever you've searched for within the Genealogy Today collection, and provide results using the same criteria. Click on one of these partner links and you'll be presented with matching listings without leaving our web site. If you find something of interest, click and visit the partner web site. As these are subscription sites, you'll need to subscribe to see the full details. What makes these two additions different from the 19 other integrated real-time search results? Well, with these two resources, you can click down and view individual record detail; whereas, most of the other integrated searches only provide summary information on our web site, and you need to click to the partner for details. 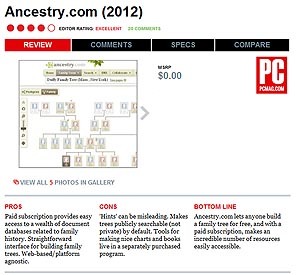 In some cases, however, the summary information may be more than you'll find at the partner web site if you're not a subscriber, making the Genealogy Today search engine an essential tool for genealogists. The time savings is remarkable, as you are able to click from one search partner to another without having to re-key in your search criteria and/or navigate your way to the search box on their web site. Needless to say, I've received fantastic feedback from librarians, who are often challenged to find quick results for eager patrons. Give the improved search engine at Genealogy Today a try. I hope you've enjoyed this little demonstration, matching the search engine capabilities of Mocavo and Google. The items that I had selected were done so at random; they are names/records that I've never looked at before, but was familiar of the sites that hosted them. It was something I wanted to do for my own understanding of the two search engines, and thought it might be helpful to share with others. While the idea of a free genealogy search engine sounds great, there are two important factors to consider: first, limiting your search to free resources leaves out a significant number of matches in commercial resources (which include most modern books still in copyright, like all of the records compiled by companies like Genealogical Publishing Company, and the extensive newspaper collection at Genealogy Bank). And second, who is to say what is a genealogical resource? In limiting your search to a collection deemed to be "genealogy resources" you may fail to locate mentions of your ancestors in other online materials. But that's no different to visiting a library that hosts a genealogy room; where I've found many interesting family history information in books located in other sections of the library. Genealogists really need a comprehensive search engine that indexes all materials, free and commercial, because at the end of the day, they want to find their ancestors -- even if it means that they have to pay out a little bit of money (sites like Ancestry now offer very affordable monthly options), or travel to the library (or archive) that has a copy of the document. This was by no means an attempt to cast a negative shadow upon Mocavo, but merely a litmus test of how well they've progressed in their mission. On February first, they announced a major partnership with the Allen County Public Library, and the addition of a historical record storage and sharing platform -- the latter being a significant move towards bringing large amounts of new information online. Welcome to Round #3, the final round, of the free genealogy search engine challenge, where we've seen newcomer Francisco Mocavo take a beating from long-time favorite Elmer Google. 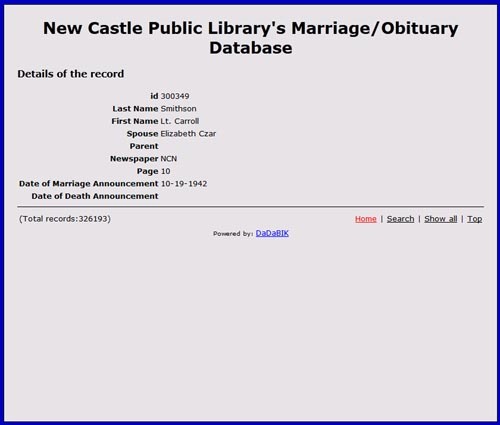 In this round, each contender will be asked to locate the 1942 marriage announcement record for Lt. Carroll Smithson and Elizabeth Czar in the New Castle Public Library's Marriage/Obituary Database. The fighters step into the ring, touch gloves and await the ring of the bell. Francisco is moving a bit slower than in the previous rounds, and Elmer looks calm and confident. This time, Elmer Google throws the first punch, just missing Francisco, with some close matches on the search for "Carroll Smithson marriage 1942." Francisco swings back, and misses with listings for Carroll County outranking any with the first name "Carroll." Elmer quickly throws a second punch, this time landing with a four position result on the search "Smithson Czar 1942 marriage." Francisco Mocavo unsuccessfully counters with a list of results mostly from online books from the Archive.org project. Both fighters realize the end of the round is approaching and there's just one last chance to aim for a knockout... Elmer takes a swing with "Smithson, Lt. Carroll and Czar, Elizabeth marriage," landing a direct hit and a number one position in the search results. Francisco is visibly shaken, and seems to have run out of energy. The same search yields 25 matches, but since the search engine only allows you to see the first page of results without registering, the referee cannot tell if the search engine was even able to find a close match. And there goes the final bell ring, signalling the end of Round #3. The crowd is going wild, and Ricky Ancestry, who loves to show off, steps into the ring... entering Carroll + Smithson + marriage event + 1942 yields our intended record in the number one position. Yes, that's right, Ancestry indexes free records as well, all clearly labelled with "Web:" in the title. The referee returns to the center of the ring with the judges' scorecards and declares Elmer Google as the winner of Round #3. That makes the overall challenge winner Google in a 3-0 victory over Mocavo. Stay tuned for our post-match analysis. The Friends of Homestead National Monument of America are developing a database of homesteaders and descendants. The Homestead Act of 1862 transferred more than 270 million acres of land, or 10% of the nation, from Federal to private ownership. The only monetary payment for each 160 acre claim was an $18 filing fee. The Act provided a robust opportunity for westward development of this country, and the needs of the homesteaders resulted in an explosion of inventions, industrial applications, and developments in agriculture, finance, art, photography, communications, transportation, medicine and much more. Homestead National Monument of America, located in Southeast Nebraska, commemorates this Act and the far-reaching effects it had upon the landscape and people. And now the HNMA is seeking your help in locating people who filed claims under the Homestead Act. 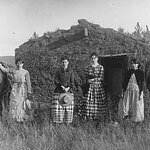 The goal is to locate and record the experiences of remaining homesteaders before the opportunity is lost. For details, refer to the "Are You a Homesteader or Descendant?" section on the National Park Service home page. "Homestead Records Groundbreaking Genealogy Research"
Today at RootsTech 2012, brightsolid announced its entry into the US genealogy market with the launch of a "pay-as-you-go" web site named censusrecords.com that will let customers search all US census records from 1790 to 1930 and will house the 1940 US census records when they are released later this year. "In short, censusrecords.com will offer greater choice, flexibility and affordability," says Chris van der Kuyl, CEO of brightsolid. "Those researching their family histories will now be able to choose which payment method best suits their needs and their budget." Visitors to censusrecords.com will be able to search for free, but will have to pay if they wish to view documents, and download them to their computer. They will be offered the option of either buying a subscription in the conventional way or buying pay-as-you-go credits, starting at $7.95. Pay-as-you-go customers will be able to buy further credits at any time, giving them the freedom to spend as much or as little time and money on their research as they want. This approach to online database access has been commonplace in the U.K. for many years, but has yet to be successfully deployed in the U.S. market. "The launch of censusrecords.com is just our first offering to the US market," added van der Kuyl. "It will be followed later this year by the launch of findmypast.com, which will be our flagship American brand." Since 1994, the brightsolid group has been delivering online innovation and pioneering the expansion of the genealogy market with leading family history websites including the findmypast global network, ScotlandsPeople, a partnership between the National Records of Scotland (NRS) and the Court of the Lord Lyon, and GenesReunited, together servicing over 18 million registered customers worldwide. Genealogists get ready for an interesting year, filled with new resources (censusrecords.com) and service options (pay-as-you-go), as overseas companies like brightsold and MyHeritage bring their years of experience to the U.S. market. This should prove to be more exciting than the 2006 launch of Footnote (now Fold3.com and owned by Ancestry) and WorldVitalRecords (turned FamilyLink.com and now owned by MyHeritage). In the past year, genealogists have been given a new option for locating free online resources. So, has it helped? While there have been a lot of positive reviews of Mocavo, launched in March 2011; I thought it would be interesting to put it to a test against the search market leader, Google. 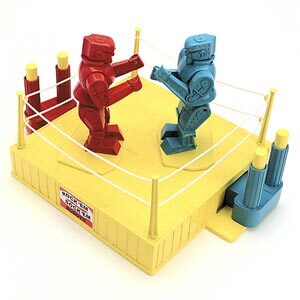 Please note, this is a fictional portrayal of a bout between two search engines. The searches will be real, but the rest is simply intended to make this challenge more entertaining. Ladies and Gentlemen, welcome to the 2012 genealogy search engine showdown. This three-round title fight will challenge each search engine to locate a specific ancestor (that I have already located online). 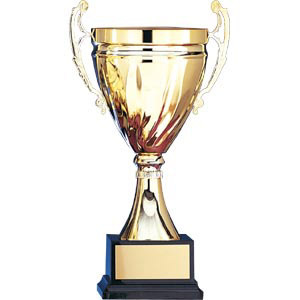 The winner of each round will be decided by the number of clicks and/or search attempts until the pre-determined record appears on the first page of search results. Failure to locate a record may result in the referee declaring a technical knock-out. In the event of a tie at the end of the three rounds, there will be a sudden-death-record search off. Here are the challenges: Round #1: Burial record of Silvio Archilei, b. 1915, d. 1995. Round #2: Citizenship record for Henry A. Foye, 1894. Round #3: Marriage record for Carroll Smithson, 1942. The referee will start each round by searching for the name alone, and then adding one more fact with each search attempt. At the end of each round, there will be a brief intermission where heavyweight Ricky "Tricky" Ancestry with coach Tim Sullivan will attempt to locate the same ancestor. What's your favorite search engine for genealogy research? Will you be cheering for Team Movaco? Or Team Google? Stay tuned as Round #1 of the free genealogy search engine challenge match takes place later today. This event is neither endorsed nor sanctioned by any of the people mentioned above. (1) "LAUNCH Instant 001: Mocavo," March 18, 2011. (2) "Google Filtering Techniques For Family History Research," January 28, 2011. Macculloch Hall Historical Museum, in partnership with the New Jersey Civil War Sesquicentennial Committee, presents a major exhibit, “Gone for a Soldier:” Jerseymen in the Civil War, which will be on view until July 1, 2012. Included in the exhibit is an 1863 wool Hussar jacket from the 3rd N.J. Cavalry on loan from a private collection. Christened "The 1st U. S. Hussars" (a.k.a. The Trenton Hussars) the 3rd NJ Volunteer Cavalry’s eye-catching and distinctly European uniform was based on those worn by the troopers of Austria. A Federal infantryman, imprisoned at Andersonville, was quoted as saying, "We dubbed these daffodil cavaliers 'Butterflies' and the name stuck to them like poor relations." The regiment defied the nickname and proved to be adept fighters, seeing hard service with the Cavalry Corps of the Army of the Potomac in the Shenandoah Valley and through to the war's end at Appomattox. Additional Reading: 3rd New Jersey Cavalry, The Butterfly Hussars; A Horse to Ride and a Sword to Wield; These "Butterflies" have the Sting of a Wasp, and New Jersey Butterfly Boys in the Civil War (Peter Lubrecht, The History Press, Charleston, SC, 2011). Available for iPhone, Android, and other systems, The RootsTech App is easy to download and simple to use. While not a full replacement for the conference materials and syllabus, the app packs a lot of helpful features, particularly the schedule and maps which will certainly help you navigate around the Salt Palace. The RootsTech app includes the following features: My Schedule, Maps (of the Salt Palace including the Exhibit Hall), Events, Speakers, Conference Documents, Photo Gallery, Videos, Twitter, Friends and News (from the official bloggers). The RootsTech 2012 Conference App was developed by Core-Apps. brightsolid CEO Chris van der Kuyl will be announcing the launch of a new product into the U.S. market at RootsTech, the major family history and technology conference, taking place in Salt Lake City, Utah from 2-4 February 2012. Van der Kuyl will address a brightsolid-sponsored lunch on Thursday, 2 February with a talk on, “Why Everyone Deserves Their Own Episode of ‘Who Do You Think You Are?’ and How brightsolid Will Help You Get There.” brightsolid has been at the forefront of technological innovations in family history for over three decades. It hosts over a billion genealogical records across its family of brands and was this month voted Best Genealogy Organisation in the online Gene Awards. Since 1994, brightsolid group has been delivering online innovation and pioneering the expansion of the genealogy market with leading family history websites including the global network of findmypast sites, plus ScotlandsPeople, GenesReunited, and britishnewspaperarchive.co.uk, together servicing over 18 million registered customers worldwide. Over the past year, brightsolid’s online publishing portfolio has introduced new and improved collections. brightsolid is also proud to be part of the 1940 US Census Community Project, a joint initiative with Archives.com, FamilySearch and other leading genealogy organisations, which aims to make the census searchable as quickly as possible after its release. The completion of the project will allow anyone to search for their ancestors in the 1940 census for free online." At brightsolid we are committed to making family history accessible for all and believe access to these records will transform the family history market in the US,” commented Van der Kuyl. According to Daniel Horowitz, MyHeritage's Chief Genealogist, on Thursday, February 2nd, 2012, at the second RootsTech annual conference, MyHeritage CEO and Founder, Gilad Japhet will demonstrate a new online genealogy research system. Recently, Israel-based MyHeritage acquired FamilyLink.com and WorldVitalRecords.com, in a strategic move to enter the U.S. genealogy market. This was another in a series of acquisitions which have included Pearl Street Software, makers of GenCircles.com and the Family Tree Legends software; free family tree backup service BackupMyTree.com; European family social network market leader OSN (Verwandt) GmbH; Dutch family network ZOOOF; British family network Kindo.com and Polish family network Bliscy.pl. MyHeritage is also the company that made waves several years ago when they developed and released facial recognition, a powerful photo-matching tool for genealogists. It will be exciting to see if this new genealogy research system will provide an integrated search across the genealogical data they have amassed. If you're attending RootsTech 2012, be sure to get to the exhibit hall on Thursday February 2nd, from 1:30pm - 2:00 pm for a sneak demo and preview of some its (according to Daniel) amazing new features. Macculloch Hall Historical Museum, in partnership with the New Jersey Civil War Sesquicentennial Committee, presents a major exhibit, “Gone for a Soldier:” Jerseymen in the Civil War, which will be on view until July 1, 2012. This exhibit commemorates the participation and heroism of Jerseymen in a major turning point in U.S. history, and will bring together nearly two hundred objects from the Civil War from nearly thirty museums, historical societies, and private collections. Among the many objects in the exhibit illustrating the significance of Jerseymen’s actions in the Civil War is an 1862 bullet struck canteen, on loan from the Cape May County Museum. Also on exhibit is an 1863 wool Hussar jacket from the 3rd N. J. Cavalry on loan from a private collection. The museum also holds the largest single collection of Thomas Nast original works in the United States. Among this collection are many of Nast’s drawings of Civil War subjects such as A Gallant Color-Bearer (Harper’s Weekly, September 20, 1862) and The Drummer Boy of Our Regiment in Action (Harper’s Weekly, December 19, 1863), which were generally thought to influence the course of the war. For museum hours and additional details about this special exhibit, visit the Macculloch Hall Historical Museum web site. You may also want to purchase a copy of the full-color, 140 pg. catalog to the exhibit, “Gone for a Soldier: Jerseymen in the Civil War”. 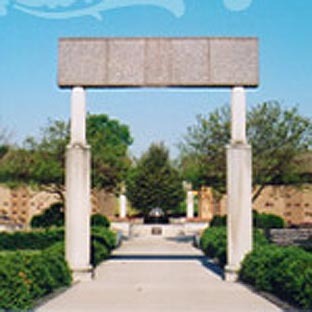 The Macculloch Hall Historical Museum (45 Macculloch Avenue, Morristown, New Jersey) preserves the history of the Macculloch-Miller families, the Morris area community, and the legacy of its founder W. Parsons Todd through its historic site, collections, exhibits, and educational and cultural programs. The museum has its own connections to Civil War history. Lindley Hoffman Miller, son of U.S. Senator Jacob Miller and grandson of George and Louisa Macculloch, led the First Regiment of Arkansas Volunteers of African Descent. Commissioned as a captain in 1863, Miller shared his war experience through letters to his family, which are on special display at the museum through December 22nd. The Union County Board of Chosen Freeholders and the Union County Civil War Sesquicentennial Committee announce the opening of an exhibit to commemorate Union County’s role in the U. S. Civil War of 1861-65. The exhibit is scheduled to open on Thursday, Feb. 9, at 2 p.m. in the Union County Courthouse, 2 Broad Street, Elizabeth, New Jersey. The Civil War commemorative exhibit will be on display until 2015 and the displays will change from time to time. For additional details, and to reserve a seat at the exhibit opening, visit the UCNJ web site. About the Civil War monument pictured in this post: The Civil War monument in Fairview Cemetery in Westfield was “Erected by the citizens of Westfield and Vicinity to commemorate the services of the soldiers and sailors of Union County who served in the war for the Union,” its inscription reads. A series of photographs featuring Civil War monuments throughout Union County will be part of the exhibit. 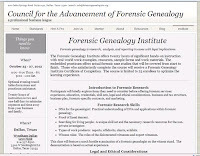 The Council for the Advancement of Forensic Genealogy (CAFG) just announced the first Forensic Genealogy Institute. It will be held October 25 through October 27, 2012, in Dallas, Texas, at the Wyndham Dallas Love Field hotel. The Forensic Genealogy Institute offers twenty hours of significant hands-on instruction with real-world work examples, resources, sample forms and work materials. This intensive course was designed by professional forensic genealogists for working professional genealogists. Formally established in March 2011, the Council for the Advancement of Forensic Genealogy is a professional business league dedicated to forensic genealogy. For additional details, visit "Announcing the Forensic Genealogy Institute"
Want to know How to Find Your Family History in Newspapers? There's a new genealogy book on the horizon, this time from the Genealogy Gem herself, Lisa Louise Cooke. The blogger, podcaster and author has sent Everything You Need to Know About... How to Find Your Family History in Newspapers off to the presses, and has an offer on her blog to pre-order a copy and haved it signed (hopefully by the author... he he). Here's a quick run down of the table of contents: An Exciting and Exasperating Record Group; What to Look For in Newspapers; Top 10 Tips to Remember Before Starting Your Search; The Newspaper Search Process; How to Identify Newspapers that Meet Your Criteria; Online Digitized Newspaper Collections; Portal Websites; Need More Help? Here's Who You Should Ask; African American Newspapers; Caring for Newspaper Clippings; along with several helpful website and library lists. Lisa writes that she "really wanted to find a record of [her] Great Grandparents marriage in the newspapers. They were married just a year or two before the Great San Francisco Earthquake rocked the county courthouse. The official record no longer exists. Newspapers were [her] last hope." Her successes serve as a case study in Chapter 11. 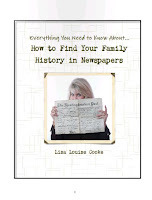 To find out more about Lisa's new book, visit "Pre-Order Now Available for Signed Copies of How to Find Your Family History in Newspapers." I'm a fan of Lisa's other contributions to genealogy, and am sure this publication will be a valuable research resource for genealogists. 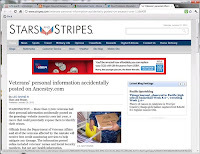 It's hard to believe, but according to an article in Stars and Stripes, more than 2,200 veterans had their personal information accidentally posted on the genealogy website Ancestry.com last year. Apparently, some Department of Veterans Affairs officials supplied the information to Ancestry.com in March 2011 as part of a Freedom of Information Act request. The records were supposed to only contain information on deceased veterans, but also included more than 2,200 living veterans due to a department error. Since Genealogy Today tracks all new releases from database publishers, it was pretty easy to figure out the database in question. Looks like it was the "U.S., Department of Veterans Affairs BIRLS Death File, 1850-2010," released on November 1st, 2011 and no longer accessible. According to a statement released by Jerry Davis, the VA's chief information security officer, all of the information has been removed from Ancestry.com, but it makes you wonder why it took so long for them to discover this error. For additional details, read the Stars and Stripes article, "Veterans' personal information accidentally posted on Ancestry.com." Just about every day of the week, something at Genealogy Today is improved, or new data records added, and that got me to thinking that perhaps I should write a short blog update at the end of the day. Looking back at my blogging history, I tend to only create updates for things that (I think) are the most interesting. And perhaps some genealogists would find the smaller changes interesting as well. I was also thinking of starting up a series of blog posts where I grab a screen capture from somewhere on the web site and explain what the particular service/feature is all about. Might be helpful in conjunction with the nightly posts to get feedback on specific areas that have been (or need to be) improved.